H7031L is a premium quality 1,413 µS/cm conductivity solution standardized with a conductivity meter that has been calibrated with potassium chloride NIST 2202 SRM (Standard Reference Material) in deionized water for analytical use in accordance with ISO 3696/BS3978. Additional equipment used in preparation of the solutions include certified weight-checked balances, Class A glassware and certified thermometers. HI7031L is a premium quality 1,413 µS/cm conductivity standard that is prepared against a NIST traceable potassium chloride solution. 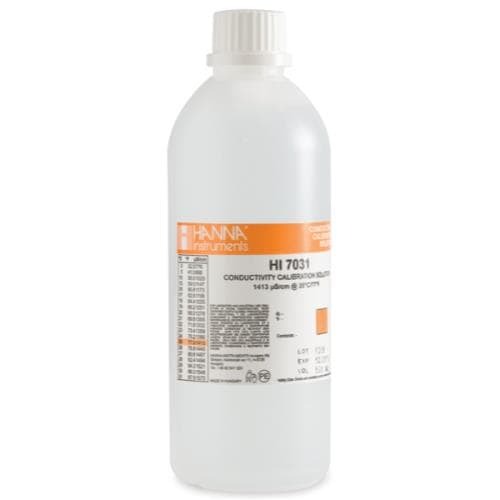 Hanna conductivity solutions have the lot number and expiration date clearly marked on the label and are air tight with a tamper-proof seal to ensure the quality of the solution. Hanna’s line of conductivity standards have been specially formulated to have an expiration of 5 years from the date of manufacture for an unopened bottle.